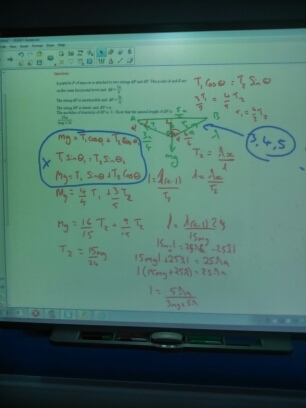 So, pythagorean triples. For those who don’t know, pythagorean triples are right angled triangles with integer (whole number) side lengths. The most famous pythagorean triple is the 3, 4, 5 triangle. Yesterday we were revising FP1 and one of my students was finding the modulus of -7 + 24i, as she was typing the required sum into her calculator I said “25” to the general amazement of the class. They were intrigued as to how I did it so quickly, I explained I knew that the 7,24,25 triangle was a pythagorean triple and this led onto a fascinating discussion. They thought it was an impressive trick, and I told them that yes, it was, and another good trick (courtesy of @icecolbeveridge) was knowing that the angles if a 3,4,5 triangle are roughly 53.13 and 36.87 degrees! Take two unit fractions with denominators one apart, add them. The answer in its simplest form will be a fraction in which the numerator and the denominator form the short legs of a pythagorean triple. The class, interested and enthused as ever, wanted to see proof that this always worked. They had tried lots of numbers and they had all worked, but they knew this didn’t prove it. I then said we would prove it together. “could we start with 1/m + 1/(m+2), then square the top and bottom of the answer and see if it’s a square? Obviously this isn’t the whiteboard… I forgot to photograph it so have recreated it on paper. Do you have a preferred method of generating triples? Or do you know any interesting facts about them? I’d love to hear them. This got me thinking about the words we use. I’ve always disliked this song as a mnemonic as it encourages people to think of the mean as the “average” when actually the mode and the median are also averages too. The median in particular is a very useful one and we need pupils to understand the distinction. I have been very impressed in recent staff meetings to hear the principal, an English teacher by trade, use the term “national median” rather than “national average”! This is a hypocrisy in the way we treat certain words. I’m not the only maths teacher who dislikes the way mean and average have become synonymous. But no one has ever mentioned that the word arithmetic is missing from the term every time we use it. I worry that we may be setting students who go on to further study statistics up for confusion in the future by simply referring to the arithmetic mean as the mean. 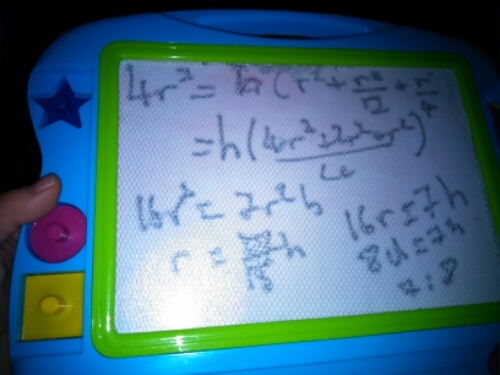 Have you ever used the term arithmetic mean, or even geometric mean, with your students? Have you shared my worry? Or do you think I’m being overly pedantic and it doesn’t matter? I’d love to hear your opinion. I recently read the latest offering in Tom Sherrington’s (@headguruteacher) Pedagogy Postcard series.the series has been excellent and I would certainly advise any teachers or anyone else interested in teaching to have a read. This recent post was entitled “Pitching it up“, and was discussing expectations. Tom was posing questions about how we see our classes and if we project limitations on to them. Do we, as teachers, miss things out of our teaching because we don’t think that a class will be able to cope with it? This made me think a lot. Had I allowed him to get away with doing less than I would have allowed others to do because of preconceived ideas I had of him? Had my colleagues? How many preconceptions have affected the way I teacher people? I thought long and hard about this, and I’m fairly sure that on the whole I don’t allow preconceptions to prejudice the way I treat my students. I have built great relationships with classes that I have heard colleagues write off as unteachable. I have been surprised to hear that some students are considered naughty when they are the stars in my class, and I’ve been surprised the other way too. Recently I was told be a colleague that the year ten boy I give tons of reward points to is in an almost permanent detention in numerous other subjects. This must happen though, or the student in question wouldn’t have said that. It’s fairly understandable too. If you hear a name over and over again in a negative context then that name is going to have negative associations in your mind. We need to make an effort to fight against this, and to take the class in front of us as they are. Otherwise we run the risk of projecting negative behaviours onto them and creating self fulfilling prophecies. Every student deserves a fair chance, and not to be tainted with a preconceived idea, whether that stems from staffroom hearsay, a troublesome older sibling or data received from a previous school. I’ve written before about how stats can legitimately be manipulated to serve different points of views, especially when there are false variables at work. But recently I’ve noticed at darker art in statistical manipulation, one that is, at its heart, lying. This popped up a number of times in my twitter feed from a variety of sources. I believe it is from a Lib Dem leaflet in Manchester. As you can see, they have presented a bar chart with proportions labelled as percentages. The first screaming error is that the red bar and the orange bar are massively different heights, yet are both emblazoned by the label 39%. The second glaring error is that the percentages add up to more than 100%. The first implies that either the Lib Dems are deliberately trying to mislead voters into thinking they are in a stronger position in the ward than they are, or that they don’t realise that 39% is equal to 39%. I’m not sure which is worse?! Something else that struck me as deciving, although this time mathematically correct at least, was the choice of data. 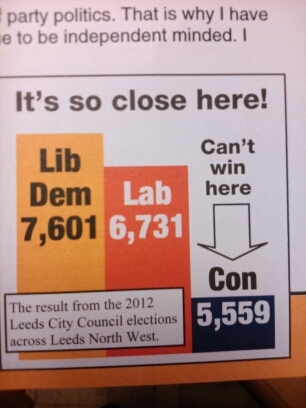 This was a leaflet issued in the run up to a local election, and the data set used was from the last local election. Why then, is the data that for the parliamentary constituency rather than the council ward? 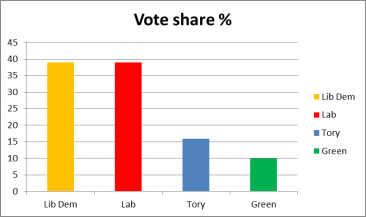 The ward makes up around a quarter of the constituency, and the vote share in the ward is radically different to that of the constituency. 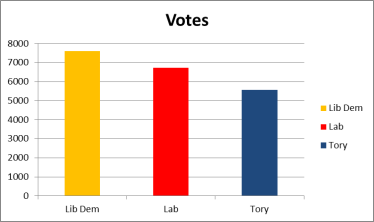 The sitting councilor is conservative and sits on a huge majority, and the Lib Dem candidate last time out cane third. 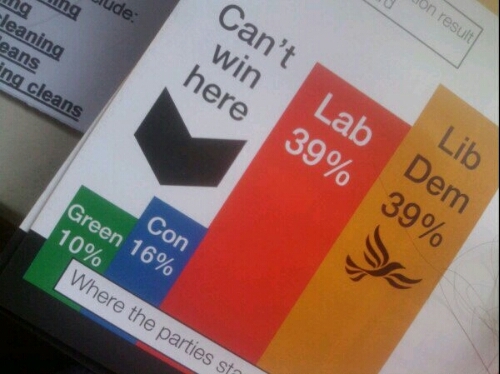 To issue a leaflet in the run up to a local election which implies the conservatives can’t win in a ward where they have a large majority and back it up with local election data for a parliamentary constituency is deliberately deceptive and misleading. This one comes from “across the pond” and is another which was viral. This one seemed to appear constantly for a few days everywhere I looked. 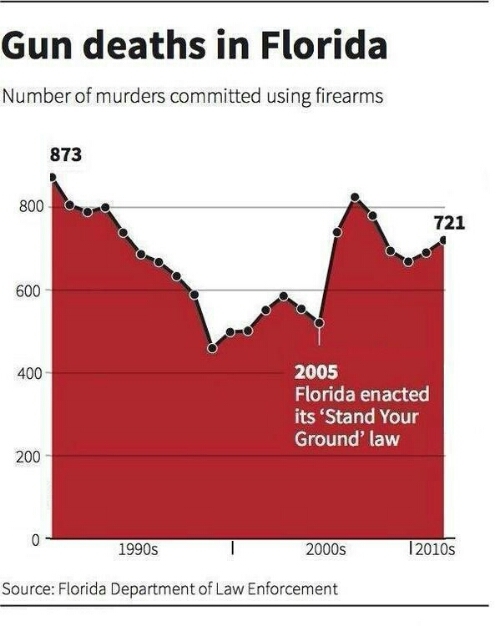 If you are still wondering what’s wrong with it, take a little look at those numbers down the left hand side…. See it? 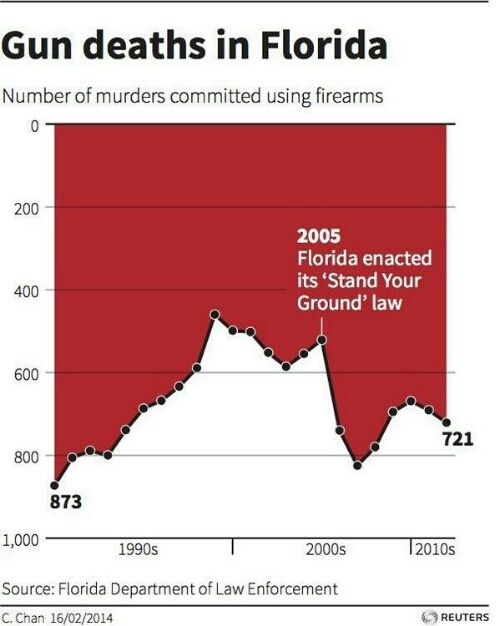 The y axis goes upwards to zero! Drew Barker (@twentythree) made this version which gives a much better picture as to what’s going on. I can’t wait to see what my classes make of these! nb I haven’t “selected” these graphs as an attack on the Lib Dems, it’s just they are the only party who have sent me a leaflet with incorrect maths. I’ll gladly expose any of the parties if they themselves do. I do collect these, so if you spot anything similar, do send me it! 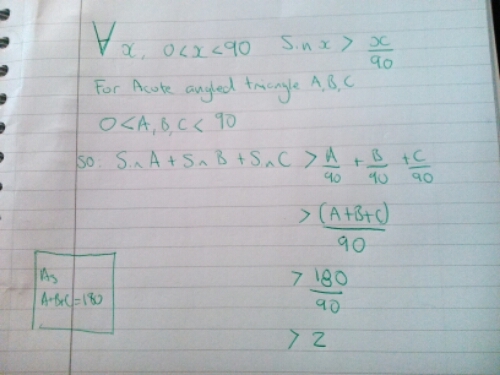 Prove that for an acute angled triangle ABC sinA + sin B + sin C > 2. This is a problem that was posed to me at a meeting of the Further Maths Support Programme (@furthermaths) in Leeds a few months ago that stumped me for quite a while, but once I realised how to the answer it seemed fairly obvious. I believe the question originally came from a step paper (ie Oxbridge entrance exam) so it is aimed at an able A Level student. Without meaning to patronise, I want to clarify the wording incase anyone was unclear. An acute angled triangle is a triangle where all the angles are acute. The vertices are labelled A, B and C. The problem is looking for a proof that the sum of the sines of the angles is always greater than 2. A straight line from the origin to pi/2 (or 90… I don’t know why I did it in degrees on this picture!) 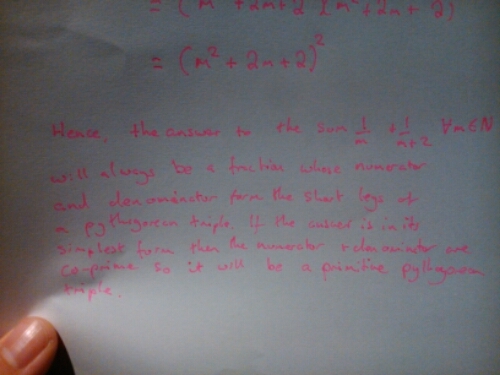 would prove that for all acute angles sin x > Pi/2 (or sin x > 90 in degrees). 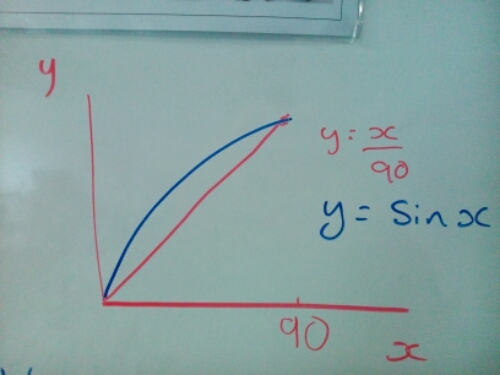 So there you have it, for any acute angle, x, it’s sine, sin x, is greater than x/90. (I’m just going to work in degrees now, as that’s what’s on the photo!). A lovely simple solution when you see it! But hard to find at first. A sphere and a conical frustum have the same volume, the frustum has a base radius which is twice the radius of its top. The sphere has a radius which is equal to the base radius of the frustrum. What is the ratio of the diameter of sphere to the height of the frustum? Recently the podcast “Wrong, but Useful“, (@wrongbutuseful) celebrated its 1 year anniversary. The hosts Dave (@reflectivemaths) and Colin (@icecolbeveridge) asked listeners to send in messages to be played on the anniversary show. I thoroughly enjoy the podcast, and particularly the part where the hosts set puzzles for the listeners to have a go at. With that in mind, I decided to set a puzzle for them as part of my messages. I know a number of puzzles, but I didn’t want this to be a problem either of them had heard before, so I set about devising one. 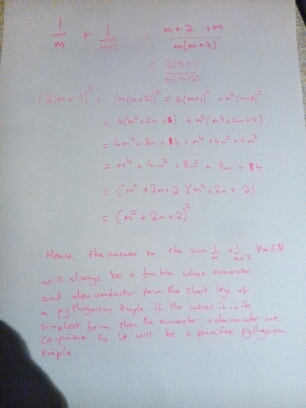 I thought about the problems I like to discuss, and remembered that I’ve always liked the algebra based geometry problems that occur at the back of GCSE papers, you know the ones: “Three tennis balls radius r fill a cylinder… What’s proportion of the cylinder is empty space?” etc. What a nice, simple, solution we get from quite a bit if algebra. I thought that as it fell out so nicely I would set it! I realised that for Dave, Colin their listeners and the majority of people I posed this question to would not really have had too much of a problem solving it, but hopefully will have enjoyed it. I did think, however, that it would be an interesting problem to pose my yr11s (and my sixth formers). They have all the skills and knowledge required, so it will be interesting to see how they get on. I will pose it to them after the holidays! Recently I’ve written a lot of posts around puzzles and problems that people have set me to solve. This is something I find fun to do and I have enjoyed solving them. I have also enjoyed sharing my thought processes and proofs here, including the dead ends I went down. The ideas involved in doing this have led me to think a lot about which, if any, of my students would have been able to solve each of the problems. I started thinking about my A level classed, I know that the vast majority would have given them a go. One or two might have not started because they didn’t know where to start, but the rest would have given it a try. I’m fairly certain that at least 5 of them, given enough time, would have solved most of the puzzles. I intend to test this hypothesis after the holidays. I then thought about my year 11 class. They are a top set and I have been trying to build a resilience in them this year. When I first took the class over in September one of the students complained to my colleague, her science teacher, that I had “given a worksheet and not even told us how to do it.” It had been a starter task designed to double check the class were familiar with and able to use Pythagoras’s Theorem. My colleague then asked her “could you not do it then?” to which she had replied “I could actually, it was Pythagoras’s Theorem.” He then asked, “so why did you want him to tell you what to do?” She had no answer. This is quite common in schools, it’s an idea a lot of pupils have. That they should be explictly told what to do for each type if question. But I think that if we are to create the mathematicians of the future we need to be building a resilience into pupils. We need to equip them with the skills and knowledge required to solve the problems, and allow them to select whichever bit of it they want/need to solve it. I think the puzzles I’ve discussed recently are good examples of tasks that do this. Some of them have the added bonus of being solvable multiple ways, often given rise to a “low barrier, high ceiling” task that can be set to 11-18 year olds and be solvable, yet challenging, to all. This one which started the chain is a lovely puzzle based around algebraic fractions. It is solvable to a clever yr7 student who just has a basic knowledge of fractions, or via simultaneous equations and complex numbers, which is how most people with an advanced knowledge went about it. This triangle puzzle was particularly nice, it had a lovely solution which requires a knowledge of the sine rule for the area of a triangle and knowledge of the sine curve, or a much simpler visual one which only requires a primary school level understanding of triangles! This triangle puzzle is the best example of one with multiple solutions. I used Heron’s Formula (which no one else seems to have heard of!) But it is equally solvable using accurate drawing, similar and congruent triangles rules and/or Trigonometry (including Pythagoras’s Theorem). These problems are great, and will build resilience, but the two most recent ones are the ones which illustrate this best. 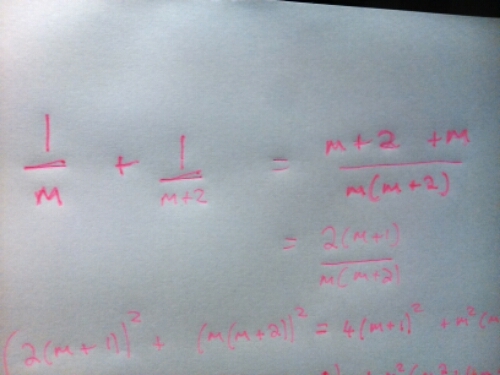 While discussing constructing a proof with my brother he was asking how algebraic proof worked. 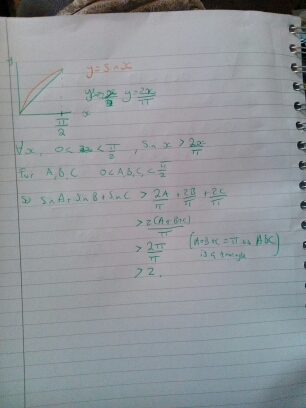 He has two A levels in maths (at A no less) but he stopped studying maths a decade ago so is a little rusty. His questions, though, made me think about my classes. I know my year 13 pupils can construct proofs, but I’m not sure about all of those pupils who are younger. I am going to ensure I build more opportunities for this into my lessons. In solving this problem I noticed a pattern in the numbers, I expressed this pattern algebraically and manipulated the algebra to prove the pattern was true for all numbers. This is what mathematicians have done for centuries and how theorems are born. And this is a skill I need to instil in my students. 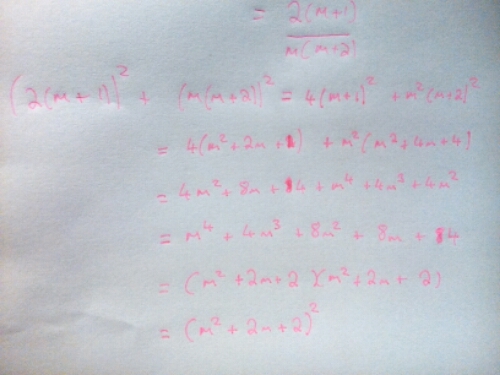 In the root of the problem I discussed solving a problem which involved searching for integer solutions of an equation in two variables. It was fun, and again I was asked, “how on earth did you work that out? I wouldn’t know where to start.” Well I didn’t know where to start either, I just tried things until I got something that was right. This is what the best of my students do. This post gives some great examples of this. It needs to be more though. As maths teachers we need to make sure our students are willing to do this, if they don’t know what to do to apply things they know until they get an answer. I have been using this approach with my pupils. I won’t help them unless they have tried something first. The way the maths exams have been previously has made this spoonfeeding possible and far too common. In the last couple if years the exam boards have thrown a few curveballs, which has meant that students have had to apply their knowledge in different ways to the past papers. I think this is the way forward, and hope the new GCSE and A Level exams address this.